The Taroona bike lanes are some of Hobart’s earliest bicycle infrastructure. Kingborough Council was the first council in Tasmania to install on-road cycle lanes – in Kingston on Channel Highway in the 1990s. I don’t know who is actually responsible for the installation of the bicycle lanes in Taroona in 2002 but I believe it comes under the auspices of DIER. I must applaud the forward thinking of whoever pushed for the bike lanes and for getting the ball rolling on the whole bicycle infrastructure problem in Hobart. So then, what’s the blog about? As such I hope this blog can be read as constructive criticism. 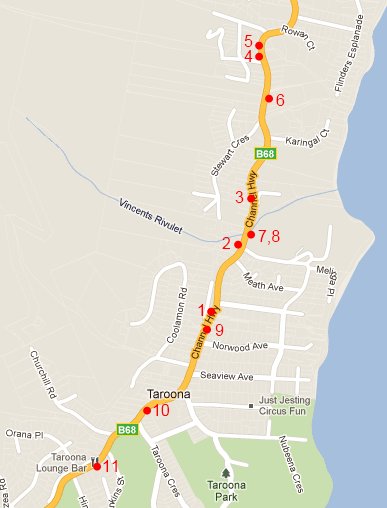 I use the bike lanes in Taroona on an almost daily basis and have become very familiar with certain pressure points on the route. Unfortunately, the Taroona bike lanes have a few problems which limit their accessibility and compromise the safety of riders using them. I’ve opted to describe these issues pictorially; the little map below shows where each of these photos was taken. The issues do of course vary in severity and I’ve tried to indicate this in terms of how serious I think the issue is and the risk to the cyclist. A general problem with the lanes is that they are very narrow – much narrower than is really necessary for a safe separation from the already narrow traffic lane. This is particularly obvious when large vehicles such as buses pass. Despite being one of the most frequented cycling routes in Hobart, the cycle lanes frequently have sections covered in gravel or other rubbish. This is a maintenance issue. The first problem is not a huge one but when wet can pose a danger to the commuting cyclist. The seams running along the middle of the bike lane have a tendency to catch wet tyres and cause the cyclist to come off their bike. Given that the bike lane is narrow, there is potential for the rider to fall into the path of an oncoming car. This is one of the more serious obstacles in the bike lane. After rounding a sharp bend, the commuting cyclist is presented with the obstacle above which completely blocks the bike lane. This is very dangerous, particularly in the wet. Most cyclists on road or commuter bikes really have no choice but to enter the road lane, at a point with poor sight lines. The drainage gap to the left is a further danger to the cyclist, being a perfect width to capture a wheel! The driveway pictured above looks navigable from the photo but in reality has a lumpy and broken surface which is treacherous, again especially in the wet. Many cyclists will opt to enter the roadway to avoid riding over this driveway. Wheelie bins are generally fairly visible but tend to be placed in the bike lane on garbage collection day in many locations through Taroona. This means that cyclists must ride in the road lane for much of the route through Taroona on garbage days. This picture shows a driver who has attempted to move their car as far off the road and as far out of the bike lane as possible. Unfortunately, they still encroach into the lane by about 20cm, and cyclists who are wary of being doored will give the parked car a wide berth, again entering the roadway. This picture also shows some minor gravel on the bike lane: the question becomes who’d choose to ride in gravel when the clean, smooth road surface is just 50cm to the right? On the opposite side of the road now, heading towards Kingston, we see one of the biggest issues with the bike lane in Taroona. There is simply nowhere for drivers to park along this section of road but smack bang in the middle of the bike lane. This of course forces riders into the middle of the roadway, causing conflict with drivers and potential for collisions. I have had issues with impatient drivers overtaking me quite dangerously along this stretch of road, where there are often several parked cars. This is unfortunately a new section of road outside Taroona Primary School. The road was widened about a year ago I believe, but some slippage has caused the bicycle lane to become virtually unusable, with wide cracks and a slope on it which is positively dangerous in the wet. It is also extremely narrow. I almost always ride in the road lane to avoid the obstacles in this section. It is disappointing that such a poor job was done on this new section of road. This picture shows more of the cycle lane outside Taroona Primary School. This one hardly needs any commentary. This drain, with its broken edges and covering 90% of the bicycle lane, is simply not safe to ride over. The blue access cover just prior to the drain further complicates safe passage. The only safe route past this drain is in the roadway. You might be picking up a pattern by now. These seem almost unimportant in comparison to some of the other issues I’ve covered. However, small obstacles in the bike lane surface are dangerous, both in terms of cyclists spotting them late and then swerving around them, and also for those who are unfortunate enough to ride through them. In conclusion, the primary issue with the Taroona bike lanes is that they are narrow and frequently obstructed. This means that cyclists must merge with car traffic in the road lane several times on a typical journey through Taroona. Frequent merging is a safety risk — it only takes one slip for a serious accident. A great series, careful and clear, although you should extend along the road past the shot tower. Thanks Amy and Luke, I hope I don’t deter people from riding! The whole question of bike lanes up over Bonnet Hill is still, slowly, being discussed I believe. Some things take forever in Tasmania – the discussion started in June 2007 and now they have appointed someone to (and I quote verbatim) “prepare a scoping report which identifies what needs to be investigated in order for a preliminary plan to be developed”. You just couldn’t make this stuff up! Thanks for sharing this. I am a long term mountain biker and only new to road riding. I have been using the Taroona route for about 8 weeks now and have been wondering what maintenance takes place. Even just the glass & gravel removal would make for a safer ride. there are also several places where the lane becomes very narrow but cars still think the bike lane is there and we end up coming very close to cars. Thanks for reading, Anonymous! I have not seen the lanes swept for a long, long time. Perhaps a call to DIER may do something? I have read your blog with interest. My sister-in-law is due to move to Taroona soon and hopefully my husband and I will be visiting her next year from England. We are keen cyclists. Are you not able to band together with like minded people in order to lobby your Councellors? Ride out in groups and really get a commission going. I hope that when we get there you will be well on your way to getting things improved. Good luck. Thanks for reading, Mrs Hodgson. There are certainly some organised groups locally — most visible would be Bicycle Tasmania — but things move slowly here. After a long, long time, the road between Taroona and Hobart city is finally having some bike lanes added, but these have been downgraded from the originaly design to “door zone” style cycle lanes. A step in the right direction but a long way from ideal! The Taroona lanes have been extensively mauled by roadworks recently and I wait with interest to see if they will be reinstated, and if so whether they will be improved in the process.